At the foot of a mountain lies a plot reportedly owned by President Emmerson Mnangagwa in Kuwadzana Phase 3. The mountain has come to be called by the locals as “Gomo raMnangagwa” loosely translated to Mnangagwa’s mountain. The mountain will forever invoke nightmares to the hundreds of local residents who were last week frogmarched up the mountain by the soldiers during the recent countrywide protests. They were beaten mercilessly in that mountain before being forced to roll down for a distance of close to 200 metres back to the foot of the mountain. One of the victims, 35-year-old John (not his real name), says last week’s events on that mountain resembled a horror movie. 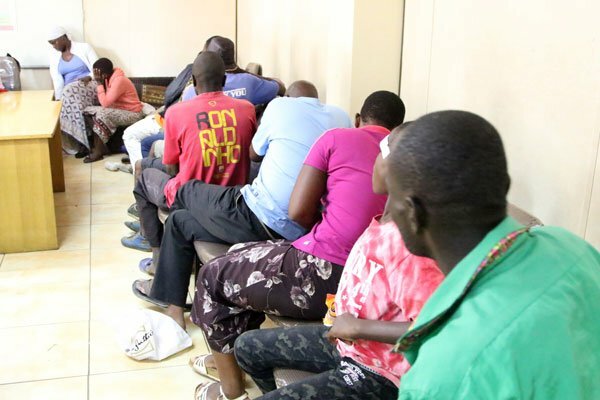 He sat in the corner of a big room at the Counselling Services Unit in Harare on Friday as he recounted his ordeal to The Standard crew who had visited the place that was teeming with victims of military and police brutality. They had come to this makeshift clinic seeking medical attention after being tortured by the security forces. His left hand rests on his knee, his chin buried in the palm and like a dejected child, a story of anguish is printed all over John’s face. John’s right hand is severely burnt and blistered. He also has a deep burn on his right ankle. His buttocks are heavily swollen and he sits shifting uncomfortably as he tells his story. John said residents were rounded up by soldiers who were armed with guns and sjamboks and forced to put out burning tyres using their bare hands. The burning tyres had earlier been thrown onto the streets as road barricades by protesters. “We tried to resist, but they beat us up using motorbike chains until we submitted,” John said with tears tricking down his cheeks. “I can’t explain the pain. Imagine burning rubber sticking on our hands? I no longer have skin on my palm,” he said showing The Standard his bandaged hand. John said he had locked himself up in his house when he heard soldiers were out assaulting people. “They came and forced the door open and forced all of us out with whips. They took us to a barricaded road and ordered us to remove the barricades after putting out the fire from burning tyres,” he said. The room at the makeshift clinic where John was had approximately 38 other people among them juveniles as young as 12 who were also seeking treatment. Zimbabweans last Monday took to the streets protesting against the decision by Mnangagwa to hike fuel prices by about 150%. The protests were violent in some areas like Chitungwiza, Epworth, Highfield, Mabvuku and Tafara where hundreds of people blocked roads to stop kombis from taking people to work. As emerged at the courts where Zanu PF youth leaders are facing counts of inciting violence, arson and looting, all Zimbabweans regardless of political affiliation took part in the protests. There were also many reports of some security forces who tacitly encouraged people to go on the streets while beating up and chasing away teachers who had turned up for work. There were also many reports of the military assaulting protesters during the day and others who conducted night raids dragging people out of their homes and assaulting them. Most of the victims of army beatings whom we visited suffered serious injuries. In Kuwadzana, scores of men and boys spent nights sleeping in maize fields as soldiers were on the prowl in the area during the night. Those who failed to flee in time were caught and ordered to lie down before being kicked and beaten with steel rods. Next to John, a 53-year-old man was writhing in pain — his body was lacerated all over. He sat in a wheelchair and had a bandaged head and his hand was in a sling. “I live in Kuwadzana Phase 3. We had locked ourselves in the house when the soldiers came, broke windows and fired teargas into the house. We ran out and they started beating us up before ordering us to go into the nearby mountain called Gomo raMnangagwa,” the man recounted. “We went up and about 200 metres up the mountain we were met by another group of soldiers who ordered us to go back where we were coming from. Another victim, Tom (not his real name), who said he had come from Hopley Farm settlement on Harare South, had a deep wound in his leg and he said he had dogs set on him by police and soldiers. “I was coming from the shops to buy sugar. I had a packet of sugar in my hand when I met a group of soldiers. There were also other groups of people on the same path and we were all forced to lie down. But before I could go down, they set the dog on me and I was attacked. I sustained deep cuts here,” said Tom while showing his scars. He was walking with the aid of crutches. Another woman we found at the “clinic” said she had been burnt around her waist using a steel rod. “They came to me and asked me where my husband was. I told them he had gone to work and that seemed to anger them. They dragged me out of the house and forced me to roll in raw sewage before beating me up. “Before they left, they told me to tell my husband that he was responsible for her bashing. When I thought it was over, they dragged me to the road which had been barricaded with huge rocks. They forced me to lift the rocks off the road and in the meantime one of them pulled a hot metal out of a fire and burnt me around the waist,” she said, showing The Standard a deep blister around her waist. Another woman, a mother of a two-month-old baby also from Hopley, said she was forced to throw her child onto the bed before she was dragged outside her house. She left the baby crying and was forced to roll in sewage before being beaten. “This whole side, they beat me with an iron rod. I can’t lift any object and can’t sleep on this right side. They forced me to leave this very young baby and made me to roll in raw sewage before beating me while my baby was crying in the house,” she said with tears rolling down her face. Twelve-year-old Sam (not his real name) sustained a deep cut above the eye. He said he was beaten by the soldiers when he cried while they were beating his parents. “My mother pleaded with them saying I was a mere school-going child, but they did not listen and went on to beat me up,” Sam said. Thirty-seven-year-old Getrude (not her real name) was also beaten with a hot iron rod plucked from a fire on the road. “They dragged me from my house and took me to where the tyres were burning and asked me who had set the fire. I told them I had no idea and they beat me up and took out from the fire a red-hot iron rod which they used to beat me,” she said. Afterwards they ordered her to smear soot into the gaping wound.